Light model, ideal for strolling Paris. 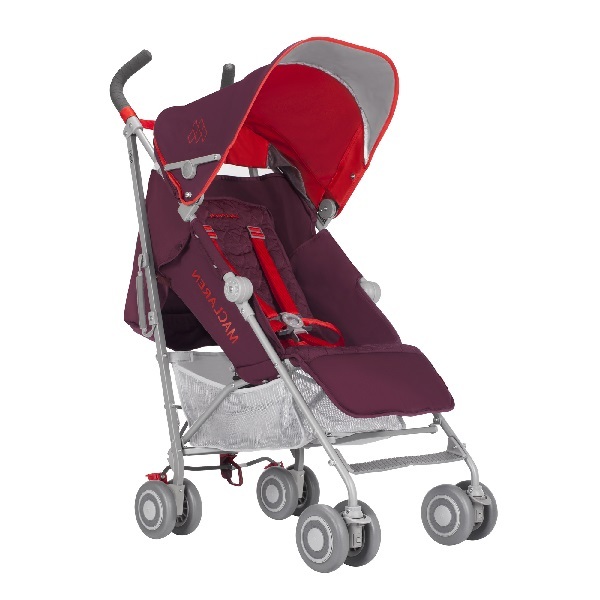 This MacLaren lightweight stroller is light and makes your city walks with baby easier. Seat reclines in 4 positions (one almost flat). Adjustable leg rest (2 positions). Footmuff or sun umbrella delivered for free on request. Suitable from birth up to about 3 year old (max 15 kgs). Color of delivered stroller may vary. See MacLaren Quest stroller demo video here. We've selected the MacLaren Quest lightweight buggy as this model is recognized for its light weight and its easy use. It is an ideal model for city walks with baby. Its seat reclines in 4 position that will allow your little one to enjoy his nap while you continue visiting the city. Easy to open and fold and equiped with a carry strap, it will help take public transportation. John (rented a stroller delivered to his hotel in Paris): "What a wonderful and helpful service that Camille provides with baby'tems. It was hassle-free and just so easy to book for our Paris trip. Camille dropped the MacLaren stroller at our hotel and it was ready when we walked through the door. It was a good brand and quality piece of equipment. There were clear instructions with it and all the accessories required. Camille took the time to clearly communicate with us at each stage in the process. We knew she really cared about us as customers. Collection was so easy too. I cannot recommend this service highly enough." "I was very pleased about the timely delivery of the stroller and the quality. At a short notice the equipment was delivered and Camille was exceptional and friendly. The stroller was light and easy to use- recommended by Camille. Thank you." "I had a great experience with baby'tems. It was such a godsend not to have to lug a stroller on a plane on top of everything else I was carrying with me for my toddler. The stroller was waiting for us at our hotel when we arrived, and the pick-up/drop-off process was smooth and easy. The stroller itself was a very good quality brand, sturdy, yet with a slim profile that was great for the city." Ashwin from the USA (stroller rental in Paris): "It was an absolute pleasure dealing with Camille. The stroller was a life saver in Paris and truly made our trip more memorable. Pickup and Delivery was a breeze. Will make use of the service again the next time I am in Paris. Would love for you to expand to other parts of Europe too. Great Service." Andreas from Sweden (pushchair hire in Paris): "We rented a stroller for our 4 year old when we visited Paris. It was very comfortable and relaxing to have the stroller delivered to our hotel before our arrival and later picked up after our departure, allowing us to use it the full length of our trip. The accessories included were spot on since we visited Paris in February the weather was at times both cold and rainy. Very good and helpful service with quick email response." John from China (toys, changing table, stroller and crib hire in Paris):"This service was excellent, friendly, and great value for money. The goods were delivered to and collected from us at the times we arranged. The goods were all in excellent condition and the accessories for the stroller (blanket insert and rain cover) were fantastic. This made our trip with our 1 year old so much easier. I really liked the list of "baby friendly" cafes and places which were given to us at the time we ordered too. I would definitely recommend this service." "Thank you so much for helping us out at such short notice with a stroller in Paris! Delivery and pick up right at our hotel was extremely convenient, and you were very helpful when I spoke to you on the phone. The stroller you suggested was great- very easy to drive and fold up, plus clean and nearly new. I have already told some of my friends about your service, and we will definitely be in touch next time we are in France. Thanks Again!" "I was going to find a place where I could buy a baby bed in case I needed it during my stay in Paris. Then I stumbled over BabyTem's homepage the night before I had to leave and send an e-mail. I got an e-mail back early in the morning and arrangement were made so I got the rented items the evening. I ended up renting a babybed, changing table, bathtub, toys, stroller and footstep - the service was just excellent, the equipment in great shape and including all necessary accessories and it made our stay so much better that we had equipment for our daughter. I will definately recommend BabyTems to anyone going to Paris."